Romantic wedding is the dream and wish of all girls. So everything of the wedding should be perfect. Do you want to design the wedding dresses to show the beauty of the bride? Come to makeover and dress up this bride. 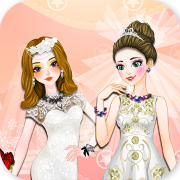 Now, the most beautiful bride is coming to the scene!Enjoy the funny wedding makeover and dress up game! Delicious cake is the favorite of most girls.Now you can make your favorite cakes and enjoy your own delicious cake by the cooking cake game. Sounds fun?Do a try. Cute babies always love bathing. But it’s really not easy to bath babies for their moms. Now please give the cute baby the happy bathing. Well, let’s start! Enjoy the baby fun games! Happy thanksgiving day is coming.Let’s design the wonderful holiday cakes for the great holiday.It’s fun and enjoy it………. Every bride wants to be the most beautiful one in her wedding.Nancy is no exception, her wedding is coming, but she’s not ready to dressed up,do your best to help and make her, to be the most beautiful bride!Enjoy it! The dogs are always fond of bathing.Now you could give the cute dog bathing and dress it up.It’s very fun and enjoy it. The wedding cake is a necessity for many wedding occasions. What should the wedding cake be like in your mind? Can you design a wonderful wedding cake? Design the wedding cake with the various cakes decorations in the game. Enjoy Wonderful Wedding Cake. © 2007-2019 All belong to their respective owners.